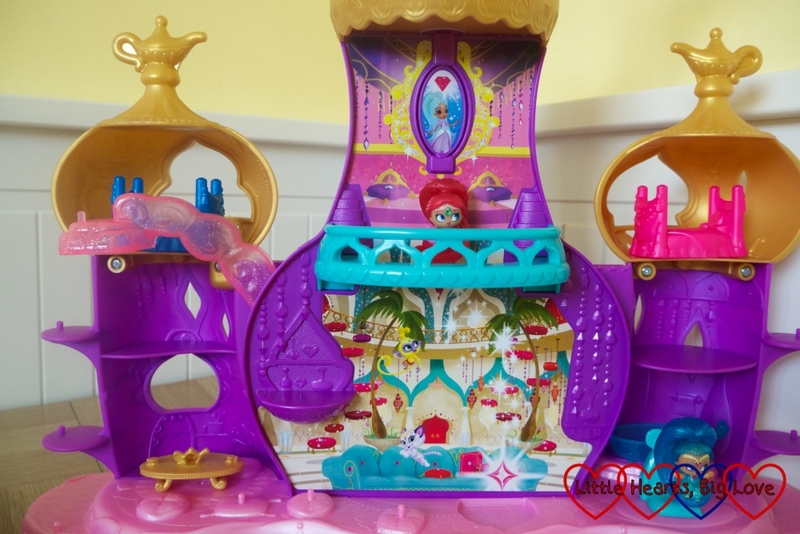 My girls love Shimmer & Shine and small world play so when I was invited to review the new Fisher-Price® Shimmer & Shine™ Teenie Genies™ Floating Genie Palace playset, I knew they were going to enjoy playing with it. 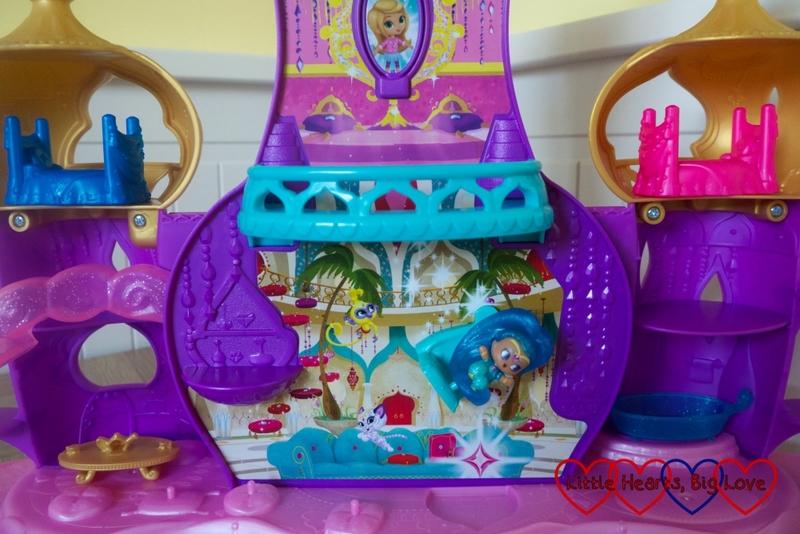 This Shimmer & Shine Playset consists of the Genie Palace and some items of furniture (two beds, a chair, a bath and a table). It also includes Friends Divine Shimmer and Friends Divine Shine Teenie Genies. The flying carpet is the only part that needs attaching. However like all children’s toys of this nature, it takes a while to get it all out of the packaging! I had it all set up and ready for when the girls came home from school. As I’d expected, they couldn’t wait to start playing with it. At first, they focused on simple small world play. They put Shimmer and Shine to bed, and moved them around the palace. There are small pegs around the palace that the Teenie Genies can fix on. The flying carpet at the top of the Genie Palace has two pegs so that the two Teenie Genies can fly around together. The girls had fun making them fly around the top of the palace. 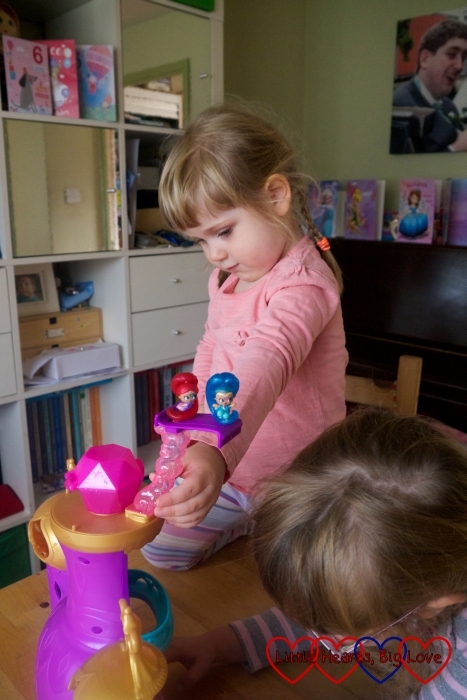 The girls were very excited when they discovered how to make Shimmer and Shine float: place them in the recess in the living room, pull down the palace’s pillow and watch as Shimmer and Shine magically float up to the balcony. They spent ages making the two genies float up to the balcony. The Shimmer and Shine Teenie Genies that come with the playset are floating genies. 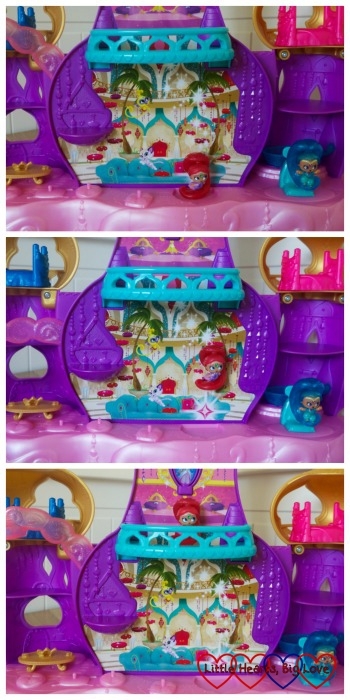 The playset can also be used with the other Teenie Genies. There are over 130 Teenie Genies to collect (each sold separately). 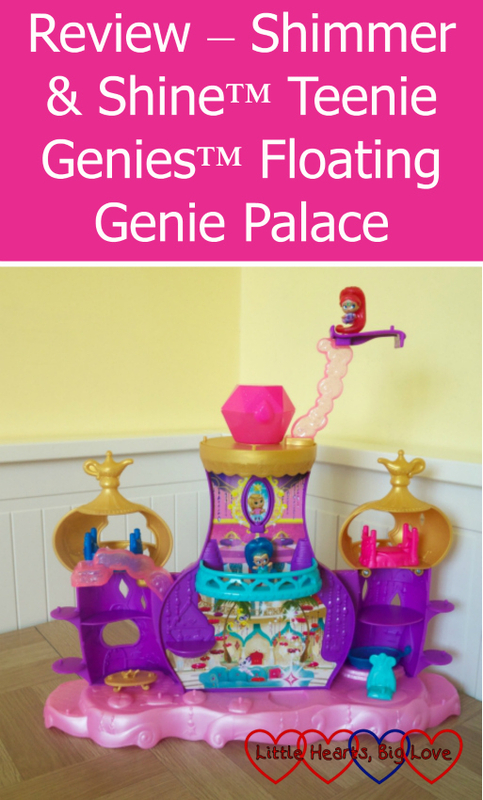 To make non-floating Teenie Genies float, just place them in the chair that comes with the Floating Genie Palace playset, put the chair in the recess and then pull down the pillow to make them float up. There is a gem at the top of the palace which has a hinged lid. Jessica and Sophie quite liked putting the genies inside this and taking them out again. The top of the gem came off fairly easily when the girls were playing with it. Thankfully it was easy to reattach. The gem also activates the magic mirror. You can turn the gem on the top of the palace to see Leah or Princess Samira appear in the magic mirror above the balcony. 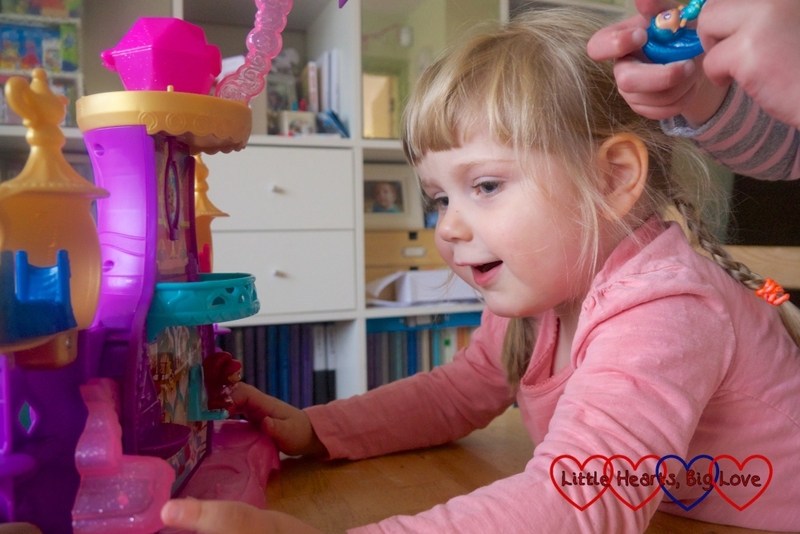 The girls certainly enjoyed playing with the Shimmer & Shine Teenie Genies Floating Genie Palace playset. I liked the fact it was colourful and sturdy and was great for small world play. I did find putting the lid of the gem back on each time the girls pulled it off quite frustrating though. The Teenie Genies are also, as the name suggests, rather teeny. They can therefore be easy to lose. We had quite a hunt for Shimmer at one point although thankfully we did find her again fairly quickly! Just having the two Teenie Genies did limit this for my girls from a small world play perspective. Having a few more genies would be better for this. I suspect we will probably add a few more Teenie Genies to our collection at some point! The Fisher-Price® Shimmer & Shine™ Teenie Genies™ Floating Genie Palace playset is suitable from 3 years+ and is available from various retailers at RRP £32.99. I received a complimentary Fisher-Price® Shimmer & Shine™ Teenie Genies™ Floating Genie Palace for the purposes of this review. All thoughts and opinions are my own. 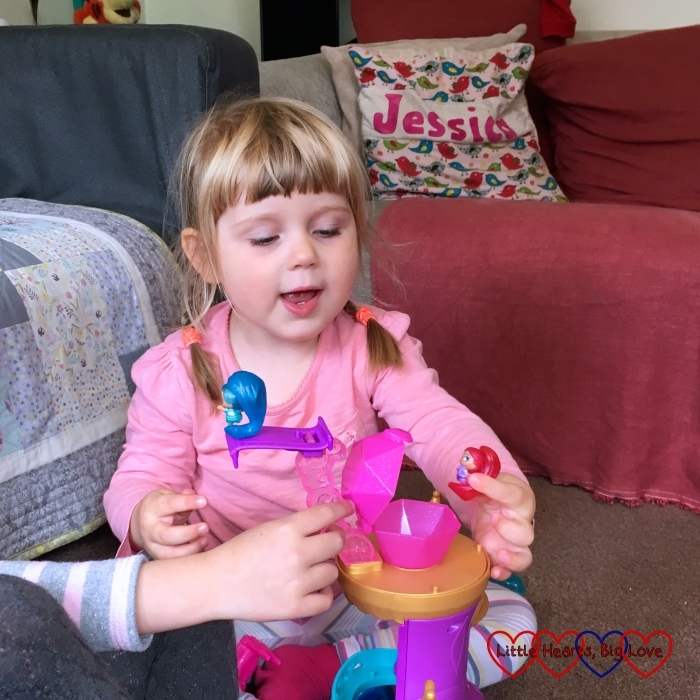 From the mouths of babes #137 – I’m a lion! My girls are too old for this now but isn’t it beautiful! I love how you can make the little genies float, that’s really clever. I’m glad your girls are having so much fun with it.